In the fifth century B.C., a Roman farmer was appointed the dictator of Rome to defend the city against attacks from the Aequi and the Sabines. After defeating the enemies, he promptly and willingly relinquished his political throne and returned back to the farm. He symbolized the “model of civic virtue” for serving the public interest and limiting his own individual power. His name was Lucius Quinctius Cincinnatus. It is appropriate that when Edward Snowden first contacted Glenn Greenwald via email to expose the NSA’s egregious and terrifying surveillance capabilities, he gave himself the moniker Cincinnatus. 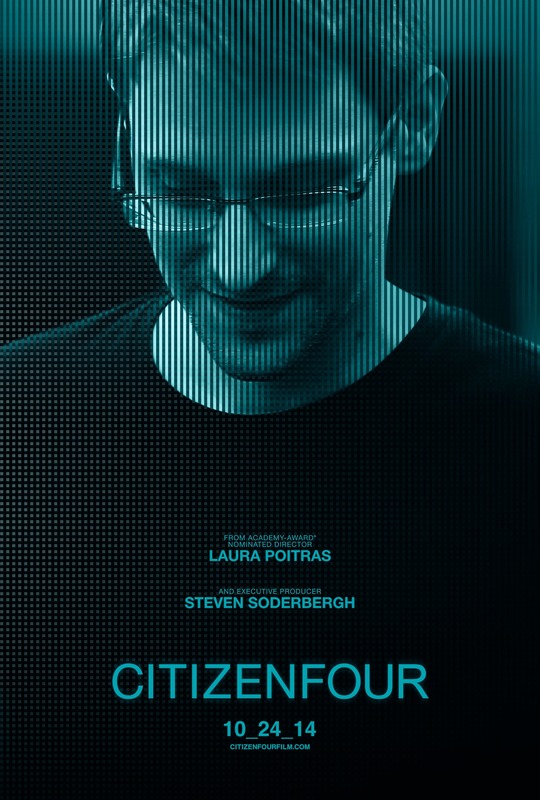 (He called himself Citizenfour when communicating with director Laura Poitras). Snowden isn’t so much comparing himself to the Roman farmer. Instead, the name is an indication that even the power of government, regardless of its good intent to serve and protect the national interest, must be limited, regulated, and transparent. It is a reminder that the line between civic virtue and abuse of power cannot be blurred. This is the primary concern that is explored in Laura Poitras’s documentary Citizenfour. It is not hyperbole to declare that it is the most important film to come out of post-9/11 America. This past Sunday, it won the Academy Award for Best Documentary. Frankly, it deserves Best Picture as well but I digress. While Citizenfour is a far more compelling film than most Hollywood sausages out there, it is more importantly a piece of evidence that unearths this government’s Orwellian methods and shatters the myths and fantasies about America’s democratic state. There are two ways of interpreting this film. First, it chronicles the events of how Edward Snowden became one of the most important, selfless, and necessary whistleblowers in the history of the United States. Second, it underlines how a seemingly democratic nation works to suppress such figures. Poitras does an exceptional job at melding the informative collection of interviews with a tone that plays like an espionage thriller. For example, the opening shot of the film, which is a bit Tarkovskian, produces an unsettling tone as we drive through a pitch-black traffic tunnel. Although it is foreboding and ominous, it is also symbolic of the underground network that Snowden, Poitras, and Greenwald are going to operate under in order to unveil the light at the end of the tunnel. Through voiceover, we learn the beginnings of Snowden’s contact with the Poitras. Based on his encrypted emails, he comes across as careful, precise, and justifiably paranoid. In one instance, Snowden warns her about constructing a solid password because her “adversaries” have the capability to churn out “one trillion guesses per second.” We see messages masked by endless lines of indecipherable codes as if from The Matrix. Furthermore, we realize this nerve-wrecking tension is exponentially heightened because this is not fiction and real lives are at stake. However, through no fault of the film, I imagine it would be more effective if we did not have any preconceived notion of Edward Snowden. This is highlighted in Glenn Greenwald’s book No Place to Hide, which should serve as a companion piece to the film. While the film is superb, it is also flawed because of two glaring omissions. In the book, Greenwald recounts the story of their thrilling introductory meeting with Snowden. Greenwald and Poitras imagined Snowden to be an older gentleman who, after exerting years of work for the intelligence community, was fed up with a system he helped propagate. Instead, they were greeted by a 29-year-old man who was still in the prime of his life. Aside from his wise and intelligent perception on American politics, what was more baffling to Greenwald and Poitras was Snowden’s willingness to sacrifice his wealth, comfort, family, and home to perform this service. The second omission is how Snowden delivered a significant chunk of top-secret NSA documents to Poitras and Greenwald. These pieces would have enhanced an already exceptional documentary. Nevertheless, the significant portion of the film is centered on the interviews with Snowden. Snowden comes across as well read and wise beyond his years. We hear little from Greenwald and Poitras. It is just Snowden speaking his truth so as to circumvent any attempts by the government and media to discredit and smear him. As mentioned before, there are moments when Snowden’s justifiable paranoia takes effect. In one instance, he covers his head and the computer with a shirt because he is afraid there are cameras above that can read as he types. In a comical moment, Snowden becomes suspicious of the hotel testing their fire alarm system. Even though Citizenfour is ultimately about the heroics of Snowden, it is also about Poitras and Greenwald. Poitras’s struggle to make this film under the government’s radar and reach is another example of the suppression of free speech. Greenwald’s daring resolve to prod and push his editors to publish his article about the NSA’s surveillance abilities and the hypocrisy of the Obama administration without government consent is equally commendable. The story of Radius-TWC, the distribution label for Citizenfour, and their struggle to purchase and distribute the film is a bold and risky business maneuver. Even Harvey Weinsten, who is the boss of Radius and a vocal opponent against Snowden, had his opinion about the whistleblower changed because of the film. This is what I mean when I say Citizenfour is the most important film in post 9/11 America. I am going to conclude this review with another anecdote. A young Cuban once asked Francis Ford Coppola, who was promoting The Godfather 2, “How can you make a film that says nice things about our Revolution?” (the underlying criticism being that Cuba would never allow artists to speak against their own government and ideology). Coppola responded, “But the truth is, I believe, that the freedoms we have here are possible because they do not even come close to jeopardizing the real interests that govern our country.” Snowden has correctly proven this diagnosis. What are the real interests behind the collection of metadata of every single citizen of this country? What is justice when the government treats an ordinary citizen’s civic virtue as treason? What is freedom when ordinary citizens must censor themselves for fear of being surveilled? Perhaps I’ve said too much.